Hyperprolactinemia can be a significant obstacle for women trying to get pregnant, and reproductive acupuncture may be one way to address the condition in some women. Previous research has shown that acupuncture influences prolactin levels in women undergoing IVF. We have studies showing acupuncture can reduce prolactin levels (auricular acupuncture using NADA protocol). This study is interesting, because the researchers were looking at natural conception rates; and women who had acupuncture treatment showed significant difference – they were more fertile. 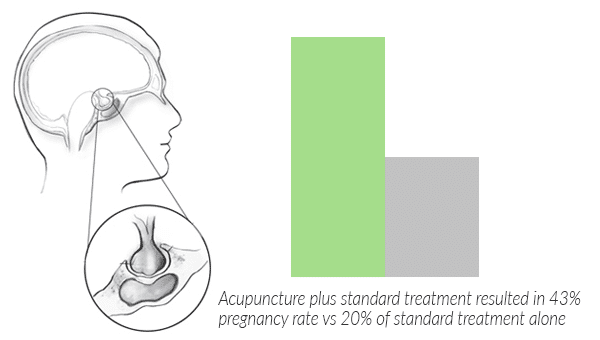 Acupuncture plus standard treatment resulted in 43% pregnancy rate vs 20% of standard treatment alone. Bromocriptine has some nasty side-effects, including dizziness, nausea, confusion, even hallucinations and uncontrolled body movement. Women undergoing acupuncture treatment had much better response to the drug, but also had fewer side-effects. Obviously, this is a small study; and further research looking into hyperprolactinemia and acupuncture are needed. The abstract of the study is below.